We’ve never seen so many boats in Liberty Bay. Easily a thousand vessels filled the anchorage, by some counts two or three thousand. 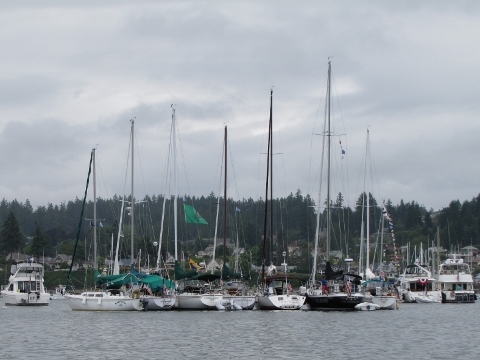 This was our first time attending Poulsbo’s Third of July Independence Celebration, and the event clearly was popular. 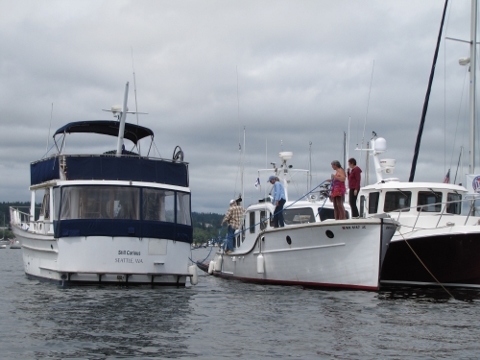 We’d been anchored at Nisqually Flats that morning when we read in the Three Sheets Northwest summary of July 4th boat-accessible fireworks displays that Poulsbo would once again have a July 3rd fireworks display. 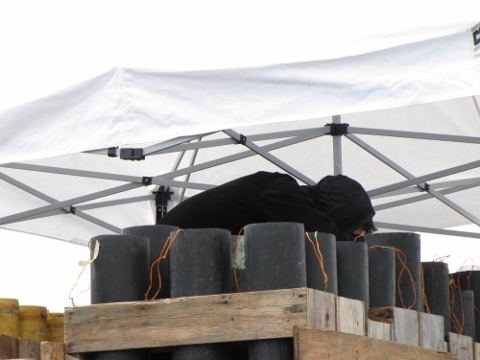 We love fireworks displays, and usually find a good place to watch onboard. 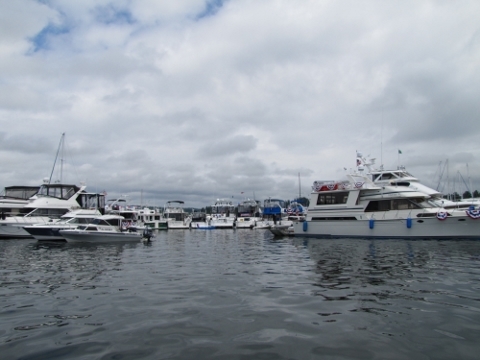 But with July 4th being on a “school night”, our only likely choice was from our slip at Bell Harbor Marina. 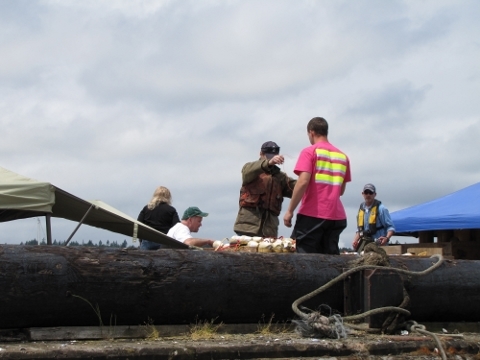 As soon as we learned about the Poulsbo display, we weighed anchor and got underway. 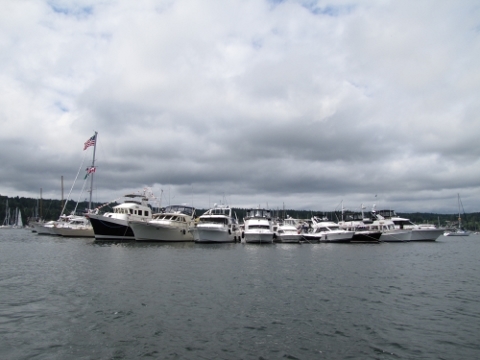 We were expecting a big turnout, but were amazed at the number of boats when we arrived around noon. The anchorage was filled from end to end, with many rafts of boats tied together. Rafts of four and five boats were commonplace, many contained at least ten boats, and some groups had formed circular rafts of more than twenty boats–that takes some organization and skill. 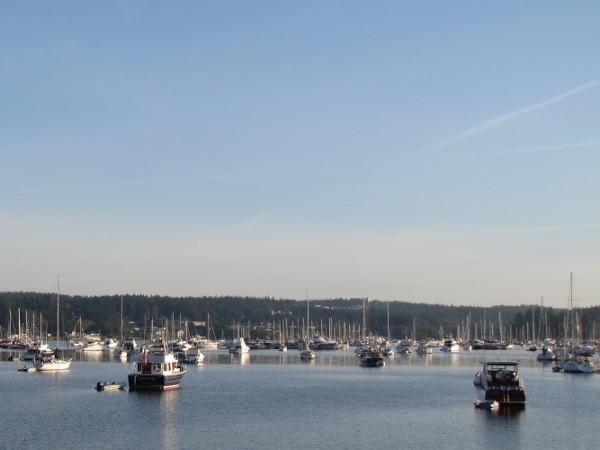 At the bottom row in the following photos are the large circular rafts of Everett (left) and the Roche Harbor Yacht clubs. Extreme tidal ranges often seem to occur on summer long weekends, and with a -2.5-foot low tide, this one was no exception. 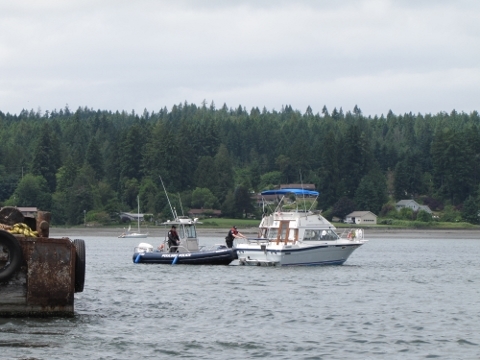 Nearby, a couple of boats were caught in the extensive Poulsbo shallows. 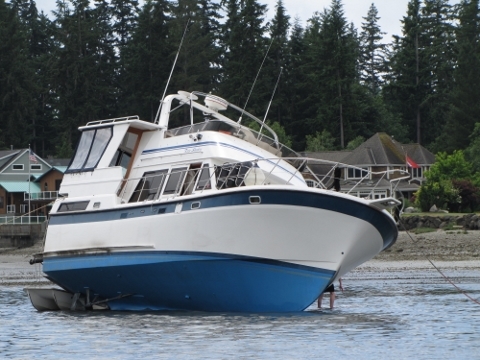 With over an hour to go before low tide, one boat was keeled dangerously over to one side. 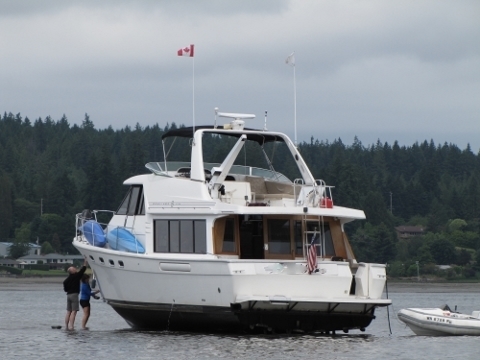 The other sat upright in the mud, and the occupants “made lemonade” by taking the opportunity to clean their hull. Both boats eventually floated off several hours later when the tide came back up. 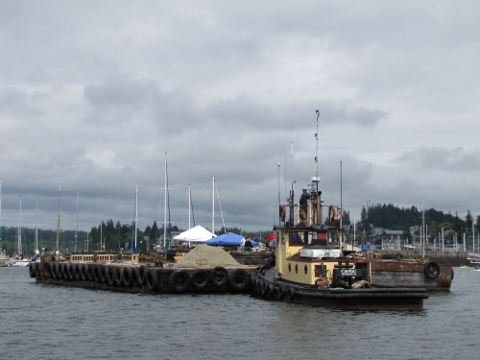 The fireworks barge arrived in the early afternoon, with workers on board preparing the pyrotechnics for tonight’s show. 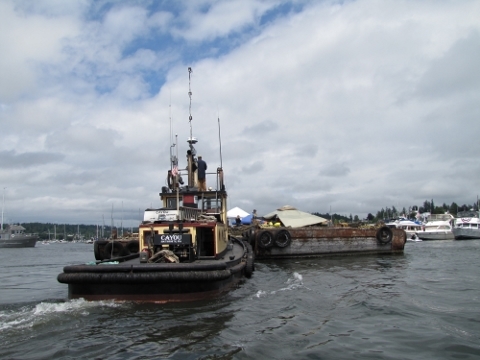 The barge actually was two barges tied together, with a tug pushing. 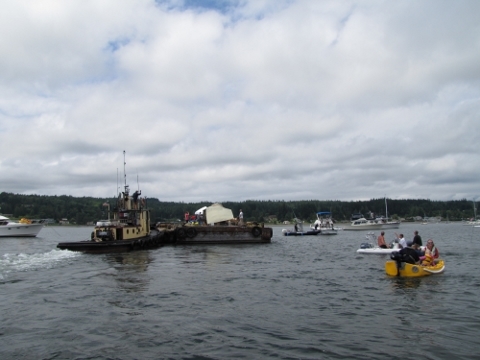 The tug captain somehow had to make his way to the head of the bay through the crowd of anchored boats. 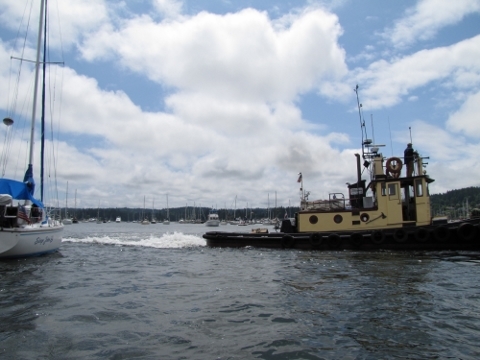 With help from the Poulsbo police boat and others who pushed boats out of the way to clear a path, the tug captain was able to work the barges through the boats and over to the head. 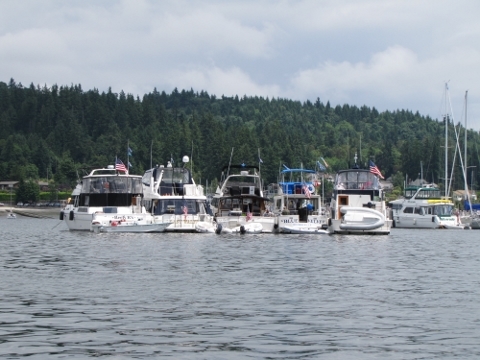 A steady stream of boats arrived all afternoon and evening until the fireworks started. Some anchored on their own, while others joined existing rafts. We found a spot at the southwest corner, on the edge of the shallows, and mostly stayed out of the craziness in the middle, where boats were anchored almost on top of each other. Our radar image below, taken shortly after we arrived, gives you feel for how full the bay already was. 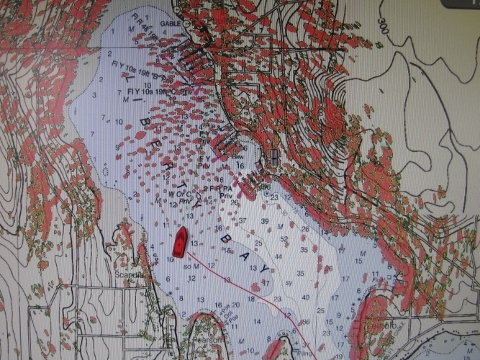 The open area in the northwest side is where the fireworks barge was positioned–the police kept it clear of boats. We had a great afternoon watching all the activity and then sat back to enjoy the fireworks display. 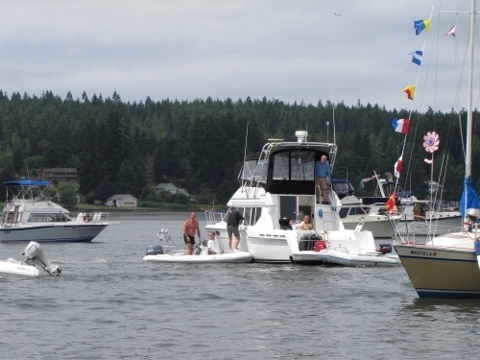 Happy 4th of July everyone, and thanks to Three Sheets Northwest for alerting us to the event at Poulsbo.